To most students, summer means relaxation; books and papers become a bad dream, the sun comes out from behind its customary curtain of clouds, and days are filled with sunshine and maybe even a trashy novel. But to the sixteen UFV students currently enrolled in VA 390, summer also means giving back to the community. With the instruction and supervision of UFV Visual Arts professor Chris Friesen, they’re transforming the blank wall of West Heights Elementary in Mission into an immense and brightly-hued mural. The title of the course is Community Art Practice, and Friesen says the experience is like no other art course offered at UFV. This is the sixth time that Friesen has taught this course, and the fourth time the course involved working with an elementary school. The project also involves a lot of planning on the part of the students — after all, Friesen says, once the mural is finished it will be a part of the school for years or maybe decades to come. It’s a hugely collaborative process, starting with the students meeting with a school committee to discuss ideas. 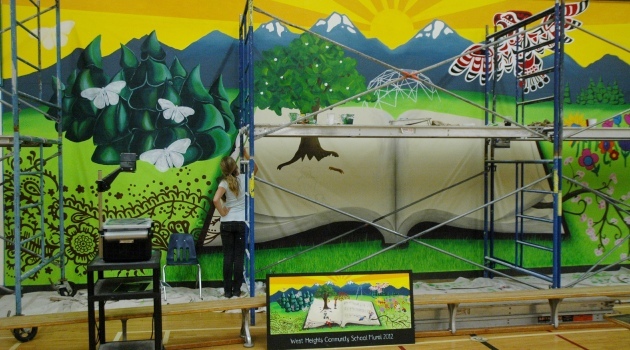 The final design chosen by the school depicts an open book against a nature background, and students are carefully adding final details to butterflies, children within the mural, and blades of grass. Along with emphasizing literacy and imagination, the students hoped to reflect the multicultural aspect of Mission in the mural. As well as the main image on the wall of the gym, the class chose to extend the themes of the mural into the rest of the school; students have painted large butterflies on two other walls of the gym, and the students have continued that image into the hallway leading to the gym. The native art style of the design ties into the butterfly image of the main mural, Friesen says, and is a way of bringing the mural into the whole school. The mural is due to be finished sometime in August, and Friesen says that it’s been an ultimately rewarding experience — for the students of the class, the students of the elementary school, and the community itself.